Teeth of the Sea, Filthy Boy, Shopping, Purson, Bethia Beadman and more. We here at The Soap company are buzzing SO hard at the mere thought of this Saturday&apos;s gargantuan musical event in the heart of London&apos;s thriving East End. 60 Bands - 12 Venues - 1 Ticket. 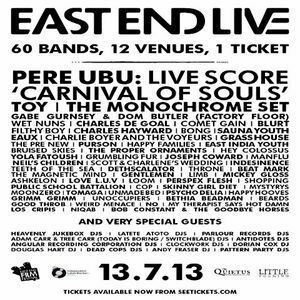 Tix £15 adv - http://www.seetickets.com/event/east-end-live/venues-across-shoreditch/707936/ - £20 on the day. We&apos;re not affiliated to the fest at all, this mix is for pure pleasure and to share the sounds!